TouchTunes, the largest in-venue interactive music and entertainment platform available in 65,000 bars and restaurants, this week announced its exclusive partnership with UPshow, a leading social marketing and digital signage company that provides in-venue social TV entertainment. 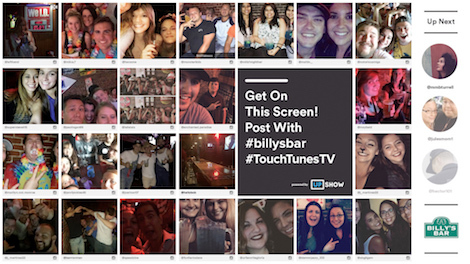 The new service, ‘TouchTunesTV Powered by UPshow’, makes the TouchTunes jukebox experience even better by transforming a bar or restaurant’s TVs into a powerful social marketing platform that drives both jukebox awareness and customer engagement. TouchTunes operators will be the exclusive channel for TouchTunesTV in the independent bar and restaurant space. TouchTunesTV Powered by UPshow leverages the UPshow platform to deliver unprecedented value for venues by helping to turn customers into their best promoters. With TouchTunesTV, customers can get their 15 seconds of fame in the venue by simply including the venue’s designated hashtag in their Instagram or Twitter photo and video posts. This creates an exciting customer experience while also generating free, authentic word-of-mouth marketing for the venue. TouchTunesTV also allows venues to build a social database of customers, and features easy-to-use tools and a mobile app to help venues manage the TouchTunesTV experience and engage with their customers. Additionally, TouchTunesTV offers digital signage capabilities that allow venues to showcase specials, events and any other marketing messages to drive additional purchases and repeat visitation. The system is also integrated with the TouchTunes jukebox, showing customers what’s playing on the jukebox, what songs are next, top plays at the venue and more. This generates more engagement and awareness of the jukebox, helping to increase music plays and jukebox revenue. Matt Gibbs, CMO at UPshow said “Music and social media are a core part of the customer experience at bars and restaurants, so bringing them together with TouchTunesTV powered by UPshow is a perfect partnership”. UPshow drives TV-powered social marketing programs on more than 3,000 screens within restaurants, bars, gyms, stadiums, entertainment venues and more. Its products are built to increase customer traffic and revenue by inspiring customer-generated content and showcasing in-venue marketing messages. This leads to additional in-store purchases and maximum word-of-mouth marketing, all while building a social media CRM. This entry was posted on Friday, March 17th, 2017 at 10:50 @493 and is filed under DailyDOOH Update. You can follow any responses to this entry through the RSS 2.0 feed. You can leave a response, or trackback from your own site.